Everybody knows you teach a kid to ride by letting go of him on a hill. A slight hill. Preferably in the grass. With you hanging onto the back of the bike. It’s so hard letting go. But you have to let go in order for them to learn. Scary thing is – it doesn’t stop with bikes. Eventually, you have to teach them to drive. Since this is inevitable (and I taught four kids), I offer a bit of driver’s education for parents who are either in the throes, or have yet to participate in this heartstopping joyous occasion. If you’re lucky, they may fail the permit test. Maybe even a couple of times. Or three. Although it upsets them, this buys you more time. By the same token, it’s a pain having to revisit the DMV numerous times. It’s the unhappiest place on earth. Nobody who works there smiles, and you just want to get out quickly because everyone’s scary. But you never get out quickly. I never saw my dad lose his cool until he taught me how to drive. A stick shift. Around an old baseball diamond. I popped the clutch 71890467 times. And jerked his head just as many. They need to be able to drive slow at first, so there must be as little traffic as possible. I’m not kidding about the cemetery. We did all of these. You people who reside in Iowa may not realize this, but we have mountains here in West Virginia. Because you can’t go through a mountain. My kids bring their flat-lander friends home from college and they don’t know how to act when they come up on a curve. We’re talking 180 degrees here, people. Move your hands when turning your wheel, they’re not super glued to it. It’s necessary before they get into traffic. We rode over the same mountain four times one day just so my daughter could practice driving to babysitting. So it begins, a little at a time. I was probably more cautious than some, but my heart could only take so much. Eventually they improve. Some catch on more quickly than others. Every time I taught a kid to drive and they neglected to apply the brakes quickly enough, took a curve too fast, or braked too hard, it happened. Everyone in the car got nervous. My other kids never wanted to ride with the older sibling learning to drive. For obvious reasons, but especially “THE GASP”. Try to keep a lid on it. It’s possible that they will not pass this test either. Especially if you haven’t taught them all the basics – such as the location of the hazard lights. I’m not saying it happened in our household. I’m just saying – it may have happened to a friend of mine’s kid. Lights, hazards, signals, windshield wipers, hazards, horn, hazards. Over and over and over and over and over. And over. This is an essential skill. The driving instructor will be looking for it. -For the love of Pete – get the birth certificate, proof of residency, and anything else the DMV requires. Believe me, you will be super annoyed if you take off work early to get your kid out of school and you discover, upon arrival, that she does not have all her information. Don’t just set them free to drive all over creation right off the bat. They’re not ready, and neither are all the other drivers out there. It’s the logical place. Once they master that, slowly let them broaden their horizons. Just don’t. Why would you even? Use common sense on this one. You’ll be able to tell if your child takes to driving easily or not. Some possess inherent good sense and judgment. Some have to learn it. I had both kinds in my household. Set down strict rules for this. If you find out they’re looking at their phone, you will need to suspend their use of it. Also – did you know you can track their whereabouts with google maps now? Take advantage of that sucker. Where was that when I needed it?! When your kid comes up the driveway with her rear view mirror knocked off and the whole side of her car scraped, you might want to teach her not to back into the driveway beside the mailboxes. The mailboxes that are now flattened beside the road. The cool was not kept by one of the parents. The other parent felt sorry for the spazzed-out kid. Another kid had an encounter with a telephone pole while backing up. There was also a connection with a cement wall. If they’re old enough to drive, they’re old enough to work a small job. At least make them pay what they can toward the damages. If the damages are purely cosmetic and the kid never gets enough money for the repair because she’s in college and uses all her money toward that, the dent may stay. Which is what happened with the telephone pole dent. This is non-negotiable because they have no business getting a ticket in the first place. But they will. And some don’t learn after the first one, either. So you there – taking the training wheels off your helmeted 6-year-old’s bike and walking her up that hill – be thankful it’s only a bike. You’ve got less than 10 years to enjoy full possession of the car keys. 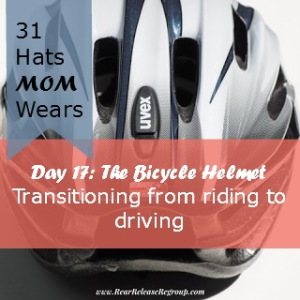 Enjoy that bike helmet while you can. And you, gasping mom, sitting in the passenger seat mashing your foot on that imaginary brake – I’m feelin’ your pain. Hang in there. Find safe places to teach him to drive, freely give of your (precious little) time, use wisdom when giving road time, and brace yourself for the dumb stuff. After all, in a few years they’ll be on their own and you can laugh when they complain about the outrageous cost of car insurance. THIS: “They’re not ready for a road trip for a long time!” More people need to realize this and remember this when teaching their kids. Tara, I can’t believe the abuse of this privilege either. It blows my mind that parents don’t give this more thought. It endangers not only their kid, but others. You had me at “West Virginia”…my home. It was fun to remember teaching my daughter to drive! HAHAHA! another GREAT post Ruthie. Our 2nd is almost ready for the permit. He knows I’m a gasper, they all know it and know they’ll have to live with it when they learn to drive. Oh dear. We stay on our knees a lot during this stage, don’t we? LOL Luke Duke’d it – knew EXACTLY what that meant (are we dating ourselves?)! So funny! It’s fun to laugh now – at the time it’s pretty traumatic. And YES – God is so good to us! We need to keep reminding ourselves of that very fact!! Thanks for reading through this series with me, Christy, I’ve enjoyed having you along so much! And thanks for the encouragement to still hook up to fmf – I’ve been hesitant because I spend so much time on each post, just because of the book endeavor and how I want to orchestrate the process. I’ll be over soon! Great tips Ruthie!!! Love your writing 😀 The first time I let our daughter practice she drove the car off the edge of the road & right into a shrub (that did happen to be handing OVER the edge of the road). We laughed and laughed. I’d picked a deserted place with no live bodies around. So… why not laugh!! Absolutely you have to laugh! Ahhh I remember doing some really dumb things myself when learning to drive and my dad and I laughing too. And my kids (usually much later, though)! Loved your bush story and YES – so wise to pick the deserted area. SO. WISE. Thanks for coming over! I loved your pictures of the sun coming up this morning! Erma’s quote – that was one wise and funny lady. Love her stuff. This hat I left for my husband to wear. 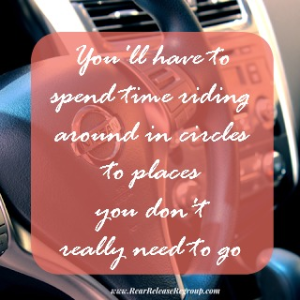 I could not and still do not enjoy driving with my children, or riding for that matter if they are behind the wheel. I can’t believe all the hats you came up with. Yes she was!!! I’ve always loved her stuff and wanted to pattern myself somewhat after her. I must confess – hubs did most of the teaching of the older two. But I was on my own with the younger two because he was out of town so much. Didn’t care for it one bit. And Jim and I brainstormed for all the hats a couple weeks ago and I wrote down ideas for each one so I could just go and pick the hat when I’m ready to write! The whole hat idea was my oldest daughter’s, and I loved it right off the bat. Thanks for sticking with me, friend! Ruthie, you are hilarious, I love reading your posts. Maybe they’ll fail, this buys you more time, so funny! True life there, girlie. I could tell you so much more. But I don’t want to scare you too much. 😉 Thanks for connecting again and for your kindness! Awesome advice! Don’t forget to teach them how to drive in snow and ice–even if you have to flood your driveway on a cold night ;). That sounds like another great story, Anita! lol you have some good ones, girl. Thanks for the visit!